Abstract. Quantitative flood risk analyses support decisions in flood management policies that aim for cost efficiency. Risk is commonly calculated by a combination of the three quantified factors: hazard, exposure and vulnerability. Our paper focuses on the quantification of exposure, in particular on the relevance of building value estimation schemes within flood exposure analyses on regional to national scales. We compare five different models that estimate the values of flood-exposed buildings. Four of them refer to individual buildings, whereas one is based on values per surface area, differentiated by land use category. That one follows an approach commonly used in flood risk analyses on regional or larger scales. 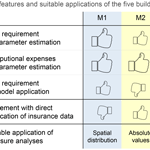 Apart from the underlying concepts, the five models differ in complexity, data and computational expenses required for parameter estimations and in the data they require for model application. The model parameters are estimated by using a database of more than half a million building insurance contracts in Switzerland, which are provided by 11 (out of 19) cantonal insurance companies for buildings that operate under a monopoly within the respective Swiss cantons. 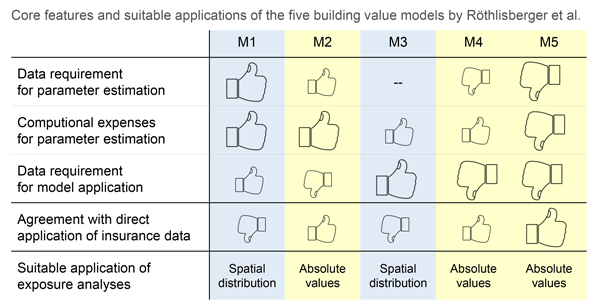 Comparing the five model results with the directly applied spatially referenced insurance data suggests that models based on individual buildings produce better results than the model based on surface area, but only if they include an individual building's volume. Applying the five models to all of Switzerland produces results that are very similar with regard to the spatial distribution of exposed-building values. Therefore, for spatial prioritizations, simpler models are preferable. In absolute values, however, the five model results differ remarkably. The two simplest models underestimate the overall exposure, and even more so the extreme high values, upon which risk management strategies generally focus. In decision-making processes based on cost-efficiency, this underestimation would result in suboptimal resource allocation for protection measures. Consequently, we propose that estimating exposed-building values should be based on individual buildings rather than on areas of land use types. In addition, a building's individual volume has to be taken into account in order to provide a reliable basis for cost–benefit analyses. The consideration of other building features further improves the value estimation. However, within the context of flood risk management, the optimal value estimation model depends on the specific questions to be answered. The concepts of the presented building value models are generic. Thus, these models are transferable, with minimal adjustments according to the application's purpose and the data available. Within risk analyses, the paper's focus is on exposure. However, the findings also have direct implications for flood risk analyses as most risk analyses take the value of exposed assets into account in a linear way. How to cite: Röthlisberger, V., Zischg, A. P., and Keiler, M.: A comparison of building value models for flood risk analysis, Nat. Hazards Earth Syst. Sci., 18, 2431-2453, https://doi.org/10.5194/nhess-18-2431-2018, 2018.